Sorry, we lost internet over the weekend, but back now! 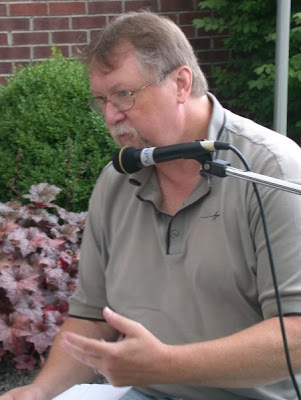 I will close the Folk Festival rev iews in this blog. 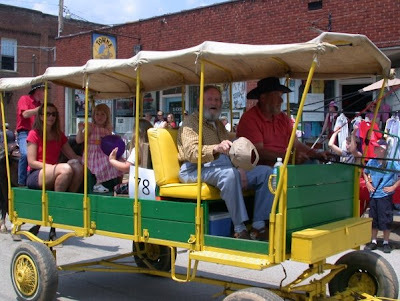 On Saturday at 1:30, the Lions Club sponsors the parade. 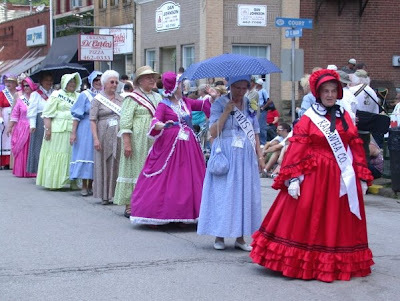 The WV State Folk Festival Belles lead the parade down Main Street. 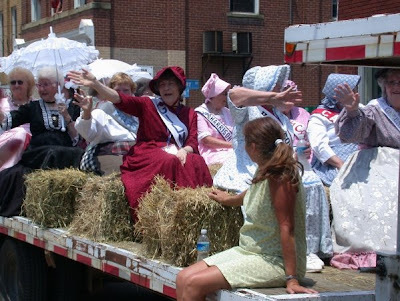 Here is Doris Norman, our Gilmer County Belle, along with a flock of other present and past Belles. 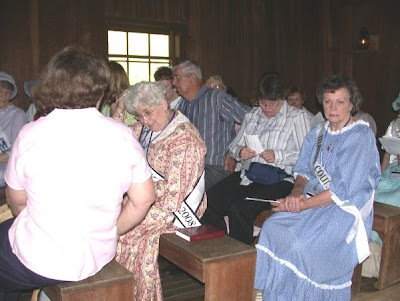 Helen James is seated with other past Gilmer County Belles. 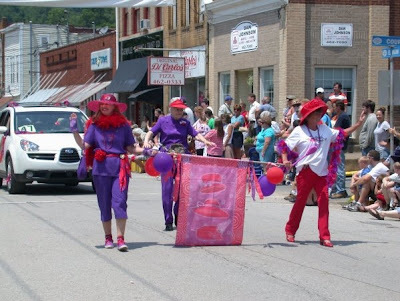 To her left is Martha Harold and to Helen's right is Bonnie Drake. First place trophy went to the Veterans unit. 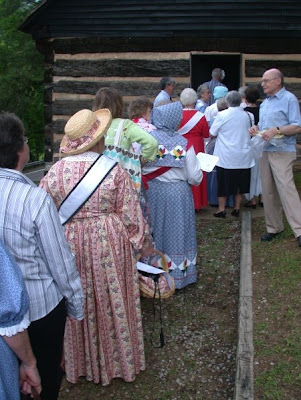 The reenactors are always a big hit. 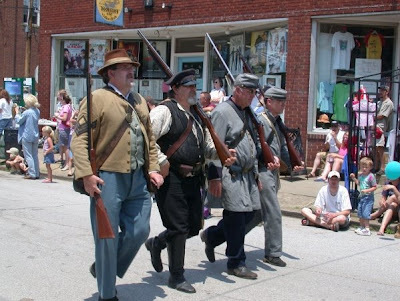 The blasts of their black powder rifles keep the crowd hopping. 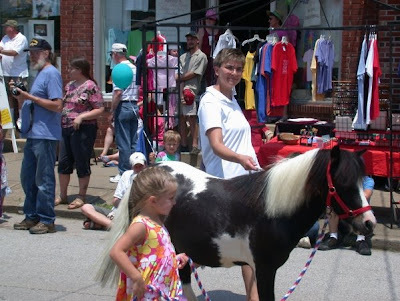 What is a parade without horses and ponies? 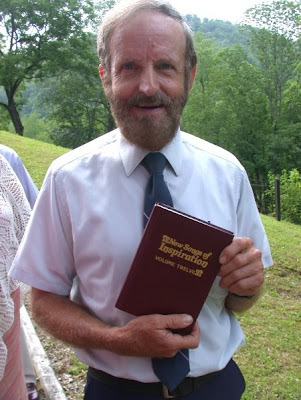 Here is Frank George. 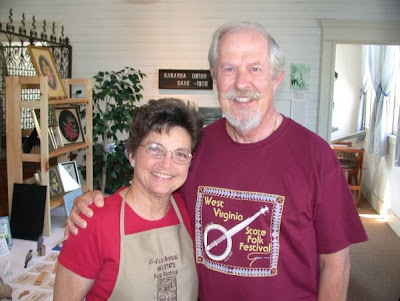 The 2008 Festival was dedicated to Frank and Jane George. Sadly Jane was ill and could not attend. 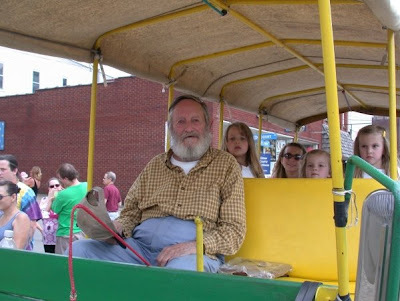 Frank is riding in a horse drawn carriage built and owned by Dean Bennett of Calhoun County. 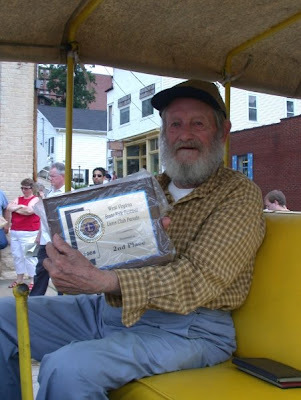 Frank George's unit won second place. The Red Hats were marching down Main Street with Fran Schmetzer dancing the entire parade route. 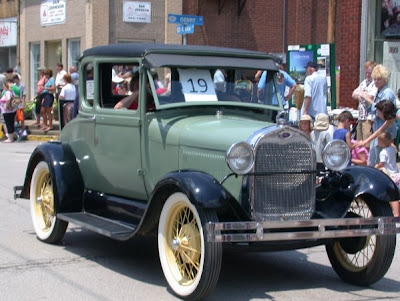 The Lions Club has an antique car show on Saturday morning. 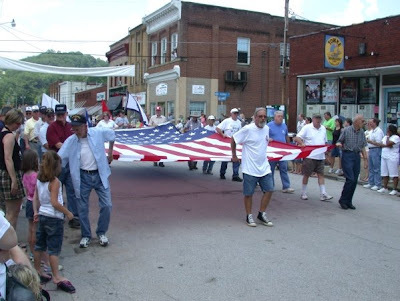 They are an important part of our parade. 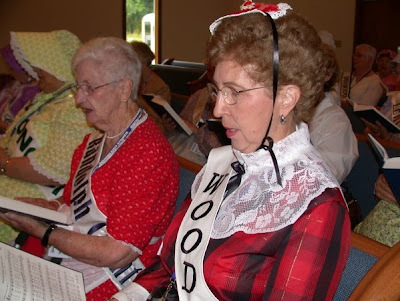 Above are our leaders for the Old Time Gospel Sing. This is a most popular session. 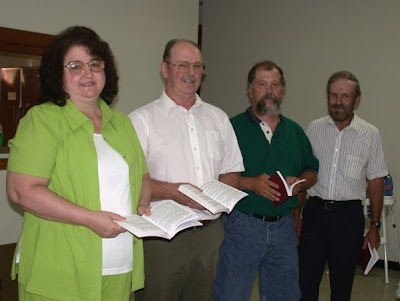 The "Heavenly Highway Hymnal" is used as the source for the old gospel songs. 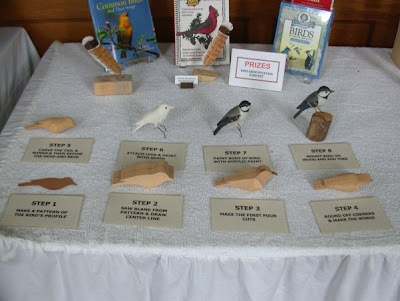 This activity is popular with all age groups. 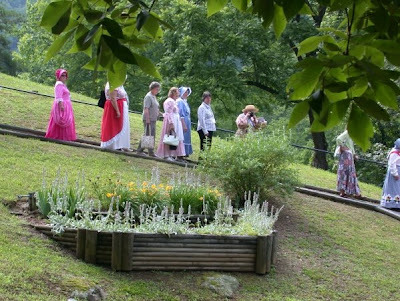 The Belles below are singing in the Glenville Presbyterian Church on Saturday morning before they have their breakfast in the fellowship hall. 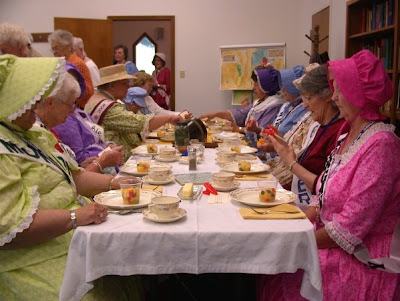 The Glenville Presbyterian ladies provide the breakfast and they do a super job. 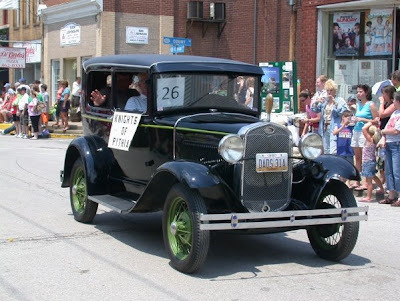 A new activity this year was an auction after the parade. 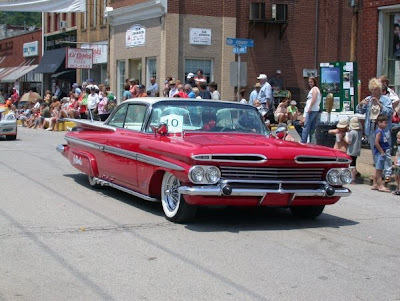 This was held on Main Street just down the street from the dance platform. 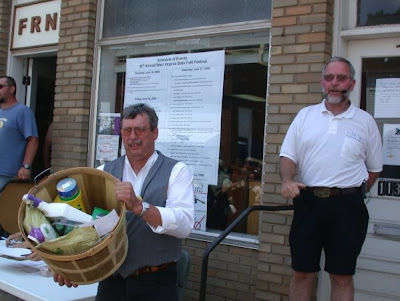 The auction was a money raiser for our Festival. 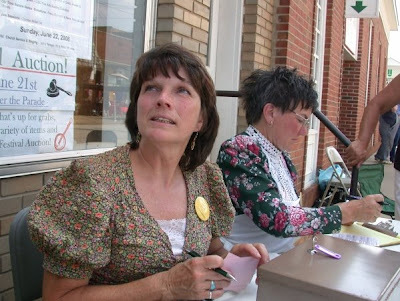 Here Mary All Risley and Deb Martzall help with collecting monies and recording sales. 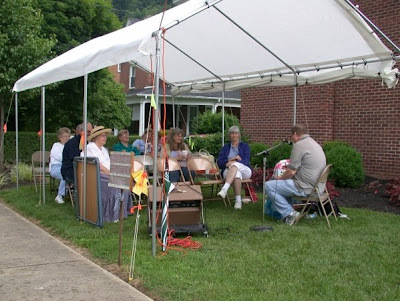 For a rest, many enjoyed the singing/oral traditions tent. 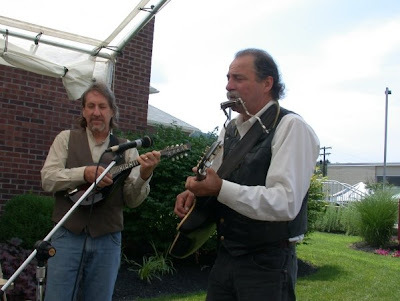 Mike Morningstar and Ricky Roberts appeared. 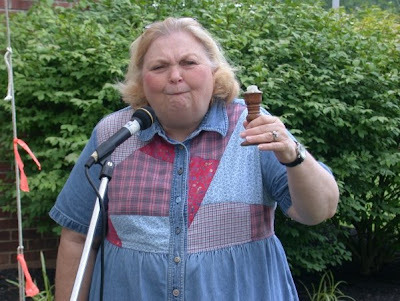 Suzi "Mama" Whaples was just one of the amazing storytellers. 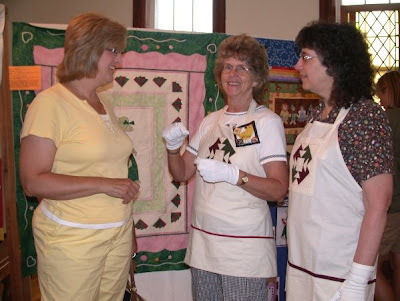 Now for a few photos of the Thimbles and Threads Quilt Guild of Glenville. 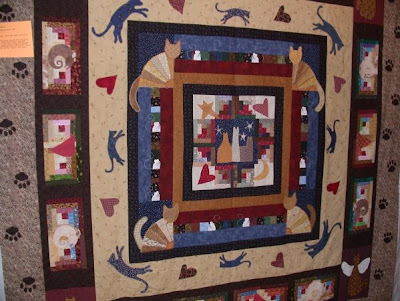 The quilt displays are exhibited in the sanctuary of Trinity Methodist Church on Main Street. 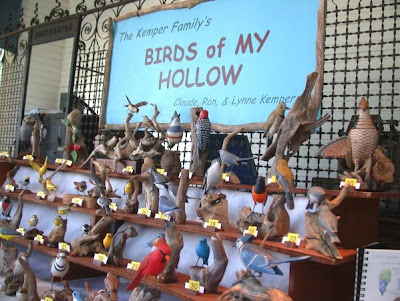 Lynne and Ron Kemper keep alive the tradition of Claude Kemper's carved birds. 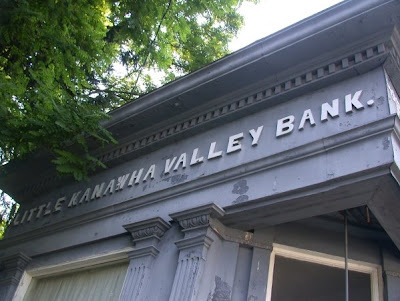 This wonderful educational dispay is housed in the historic Little Kanawha Valley Bank. 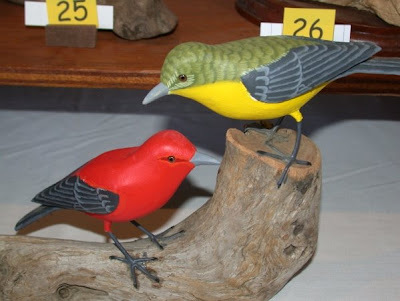 In 2002, Claude taught daughter-in-law Lynne his carving and painting techniques. 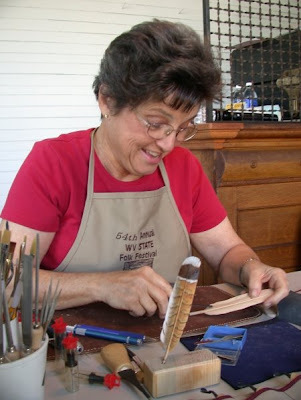 After Claude's death, Lynne is keeping his craft alive. 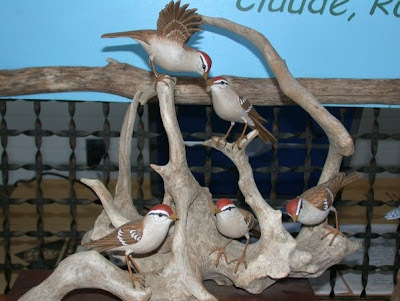 Following are examples of the "Bird's Of My Hollow" collection. 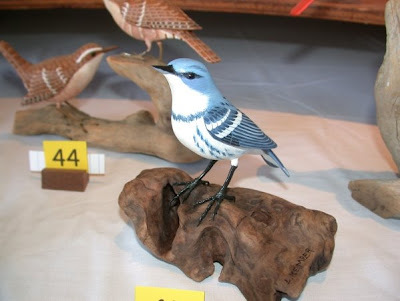 Here is Lynne's latest creation - a Cerulean Warbler. 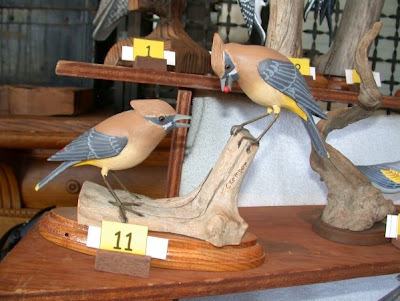 The Cedar Waxwings are feeding on serviceberry. 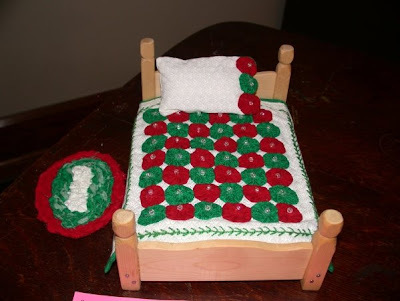 I love Lynne's skill! 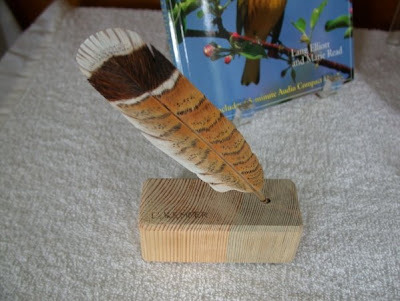 Here is a carved grouse feather. It looks as if this feather just dropped off a live grouse! 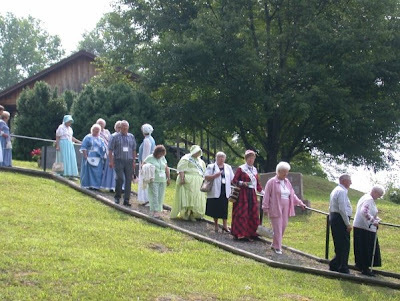 The West Virginia State Folk Festival ends with a religious ceremony at the historic Job's Temple. 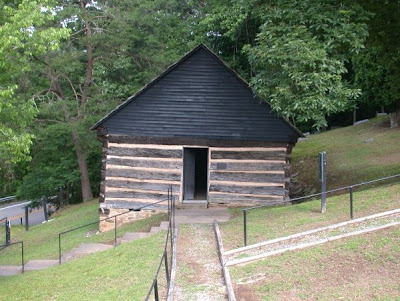 Begun in 1860 and completed after the Civil War, this hand-hewn log church building is the oldest in the county. 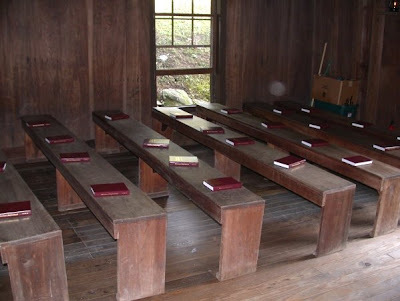 Built with local poplar trees and clay chinking, the church is 9.5 miles from Glenville on West Virginia Route 5 West. 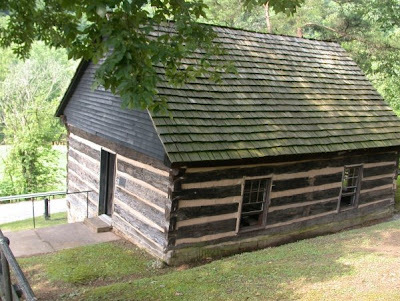 A paved driveway, parking lot and picnic shelter are available for easy access. 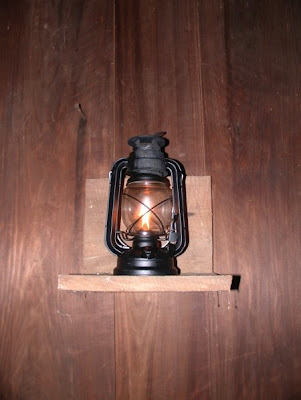 The kerosene lamps were ready for the 10:30 A.M. service. 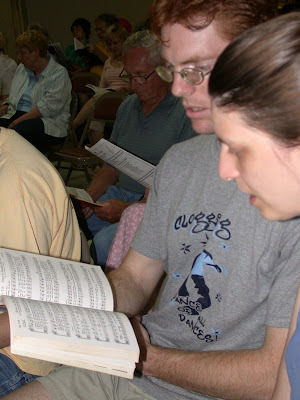 The hymnals were in place. 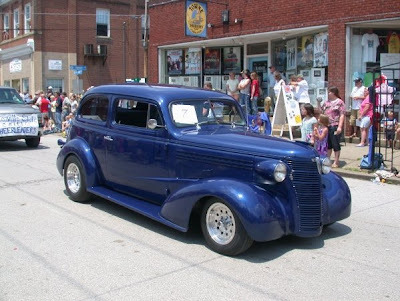 Notce the comfortable seats! 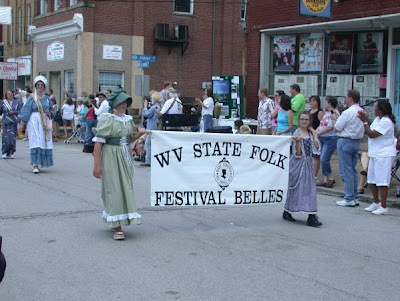 Here come the WV State Folk Festival Belles! 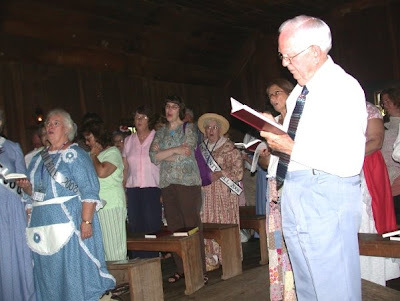 Bob Carpenter was in charge of singing the old hymns. He is a wonderful singer. 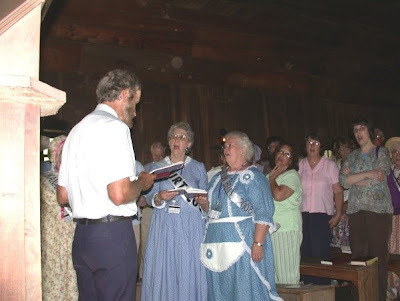 The fellow below in the white shirt and on the right is Gordon Rhinehart. 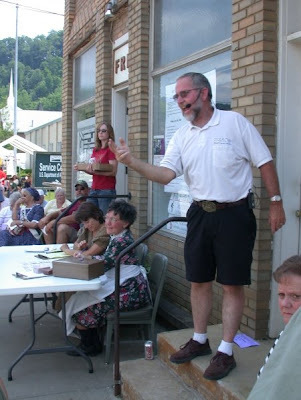 Gordon was this year's speaker. 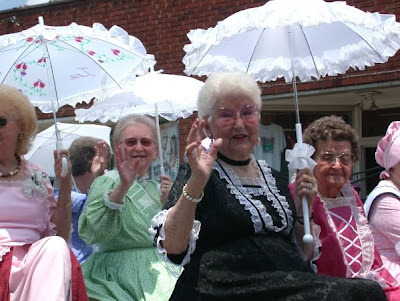 It is a wonderful time in sharing this experience with the Belles.